A Painter´s Life on Planet Goodaboom: Two Proud! We were back working the Street yesterday, but to be honest, we totally missed the time table: we started at 14h instead of 11h! I just felt lazy, somehow, something which doesn´t occur very often, and I couldn´t really convince myself to face that kind of work. And furthermore, we didn´t even realise that they had changed the time in the night, so to add insult to injury it was also one hour later! Some German man, who had been in the Street Gallery early in the morning, came back in the afternoon and mentioned to me, that they changed the time, pointing at his watch in a comically impatient fashion. I guess he hadn´t noticed that I was not one but 3 hours too late! "What is the price of this painting, Miki?" Indeed, it couldn´t be more obvious! I realised then just what I was wearing. I -unfortunately- sold one of my favourite sketches, and to tell the truth, I haven´t many. 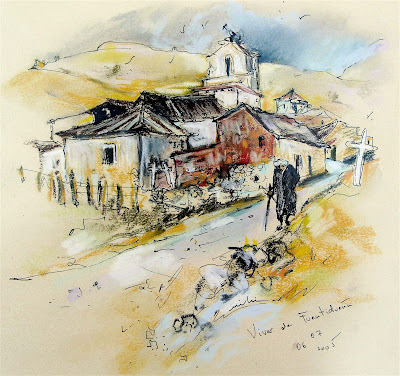 A fast sketch of a village in the "Ribeira del Duero", a famous wine region north of Madrid. I was there two years ago, on a painting trip. Sold to a Spanish Art collector from Madrid, who worked in the past in El Prado. I must say: I am quite proud!